Space News: ISS leak, Titan mapped, earliest protein, and more! According to Andy Weir, it was fixed - albeit temporarily - with duct tape. Moving on to Mars, and with the recent global dust storm now abating, there's a nervous wait to see if the Opportunity rover will fire up and send a signal back home. 4. Titan mapped - again! Much of Titan remains featureless, but as Phil Plait points out, there are some interesting Earth-like features. The expectation is that any close analysis will help us better understand the origins of the solar system. Rutgers scientists have smashed and dissected nearly 10,000 proteins and pinpointed four "Legos of life—core chemical structures that can be stacked to form the innumerable proteins inside all organisms. The small primordial peptide may be a precursor to the longer Legos of life, and scientists can now run experiments on how such peptides may have functioned in early-life chemistry. 7. Water worlds good for life? Somewhat related is the news that bacteria spreads more easily by riding on fog than just blowing on air currents: Microbes hitch a ride inland on coastal fog While that study applies specifically to Earth, I can't help but wonder how applicable it might be to life on other planets - or in space itself. 8. Changing the laws of physics - the names, anyway? The International Astronomical Union may be about to vote on changing Hubble's Law to the Hubble-Lemaître Law - to honour Georges Lemaître who actually discovered, and modeled, the expansion of the universe in a paper published 2 years before Edwin Hubble did (and even explained the principle to him, in person): Game-changing resolution—whose name on the laws of physics for an expanding universe? I love the fact that the ISS crew used grey tape, but it's not new. 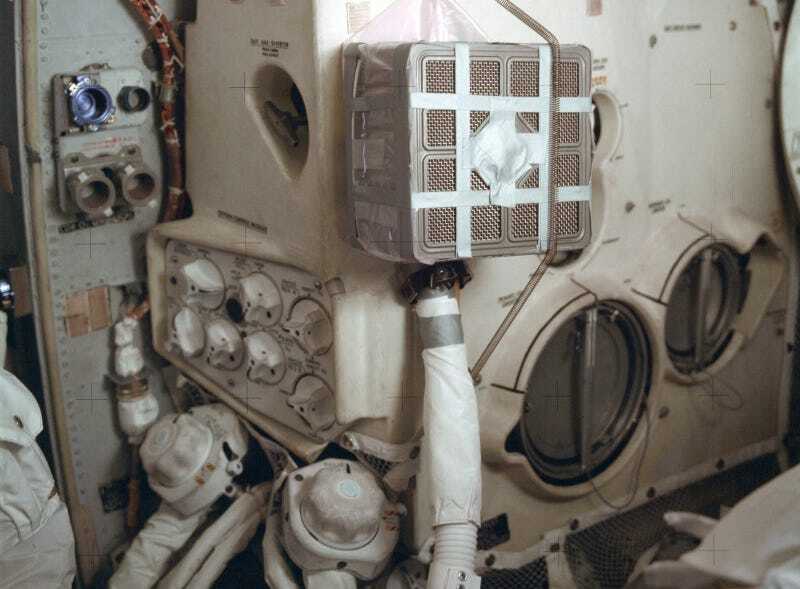 Apollo 13 used it to create the air filter they needed. This is the actual air scrubber and not from the film. Well in fairness it's not quite duct tape. They repaired it with epoxy and a 'thermal' tape. They held an epoxy gauze with Kapton, which I will now and forever refer to as Space Tape. The article about bacteria and microbes is worded strangely. Someone sent balloons up a couple of years ago and found microbes in upper levels of the atmosphere. There are microbes and fungi in the rain clouds and the rain that falls. It's been known a long time that the cold virus travels far distances in cool damp or wet weather. It's not getting a chill from being caught in the cold rain that gives you the cold, it's walking through an environment that is friendly to viruses. There are also viruses that like warm wet air drafts. We never noticed any of this because in the past the majority of it wasn't dangerous. Since it didn't hurt us, but helped us, we assumed there was nothing there. "This raises concern about the role that fog could play in transporting harmful microbes." This raises concern? Where have these people been hiding for the last 20 years? Hazardous substances could be picked up by urban fog? Smog has been around for 60 years, it's is filled with all kinds of man made hazardous substances. Do people still believe if it's natural it has to be good for you? The microbe and not so small life/water vapor connection has existed for 4 billion years. It's nothing new. It spreads life, nourishes life, promotes life by interaction with all the life it meets up with. It also damages life, but in the past it grew far more life than it took. I would have hoped that the article looked at how all these disturbing things that cause concern are getting into the fog in the first place. That part is conveniently over looked because the microbes don't have legal representation so they can't offer grant money to get their names cleared. One of the articles on the fog article page, the Hüttenberg Anomaly, Studying the atmosphere by looking at rocks 1.5 billion years old, is framed in a way that includes the past, present, and future. Astrobiology research that looked underground instead of at the stars found evidence of the way carbon, oxygen and other elements interacted during the early periods of an oxygenated atmosphere. They pointed out at the start of oxygenation there were pockets of oxygen in a carbon rich environment, and now we have developed (were here already but in smaller scale) areas that are oxygen deficient in an oxygen rich environment. There are plenty of anoxic environments around today. Go underground, go under water, even just lifting up flat rocks at the beach at low tide, the murkiness is an anoxic landscape. A subtle reminder that Earth swings any number of ways, whatever works out best. People studying sediment and rock formations are discovering many features about current Earth that were never suspected. No matter how far back into the past we look, whether it is under rocks or at stars in the sky, we can always find clues relevant to everyday life. Some of the rocks containing the the Hüttenberg Anomaly have eroded away leaving a gap in the information. With our wide scale distribution of basic chemical pollutants, compounds of sulfur, phosphorous, nitrogen, we could be recreating ancient environments that caused multicellular life to start up in the first place. People will have to reexamine older rock formations to see if the anomaly was more wide spread and to see if anyone can find the missing data. The rock formations were probably eroded away by ancient bacteria, erasing evidence of their existence from prying eyes of the future. What aisle can I find this in at B&Q? Any idea what the temperature is in the filled in hole? Cold from the space outside or warm from the inside of the station? It must not be too critical. One of the Russians stopped the leak with his finger until they brought the gauze and Space Tape. I suspect the temperature is a bit of an issue; on the inside it will be close to the temperature of the interior and on the outside it will be exposed to the extremely low temperature of space. Also some of the time it will be in sun and probably really quite hot on the outside and some of the time it will be in shade and probably quite cold. The temperature gradient may well be quite extreme at times so I guess you can't plug it with just anything. However we must also bear in mind that vacuum is a very good insulator so I'm not sure whether the external or internal temperature will dominate. I picked up that "stopped the leak with his finger" from several newspapers but not from NASA what I got from NASA was that he felt the airflow with his finger and that's how he found the leak. I guess he probably put his finger over it as well but with the hole only being 2mm I wouldn't expect any horrendous consequences from that! I read that they were told to go sleep and look for it the next day. They narrowed it down by sealing off individual modules one at a time until the overall pressure stopped falling. There's a 7mm mark on one of the windows where something tried to come through on another occasion. They're a little unclear about whether these are micrometeorites or random space junk. I noticed on this last incident that it's been called both depending on who's doing the talking and what reporters think they heard. Larger pieces of junk are constantly monitered, so the ISS is routinely moved up or down out of the way. Several years ago there was research into a kind of self-healing skin for spacecraft. This involved a network of miniature sensors in the skin that would 'sense any holes appearing. Alongside the sensing network would be a network of tubing along which repair materials could be transported to the hole that needed blocking and control software to direct operations. If I remember it correctly this was done by the Australian Space Agency (whatever they call themselves) and had reached the proof of principle stage i.e. they had a small working model. So give it about another 30 to 50 years, depending on Earth economics goes, and space tape will not be required for blocking up micrometeorite holes! During the second world war fuel tanks were made self-sealing by lining them with rubber (amongst other things) so if hit by enemy fire they didn't leak fuel. I'd have thought similar would have worked for micrometeorites. The hole has been fixed twice now. It was originally a drill hole that shouldn't have happened. Apparently a small holed fixed by a patch held in place with glue will hold up quite well in space for a good period of time. See. This is why DIY projects should be forbidden on the ISS. There have been claims that the hole could have been drilled as a mistake during the manufacturing process of the capsule on Earth. Russia is saying someone at the Russian Energiya space manufacturing company drilled the hole. That means the first patch lasted around 3 months. The Soyuz capsule has been up in space since June. That part of the capsule is jettisoned during re-entry so the hole is no problem during reentry of Earth's atmosphere. Part of the problem of identifying the origin of the hole is that the Soyuz capsules are launched in another country, Kazakhstan. It's too bad the Soyuz can't leave that part of the capsule at the station when it brings people back to Earth, that way they could easily add more living and working space to the station. This Mr. Bean sketch just writes itself. "There is evidence that a technician saw the drilling mistake and covered the hole with glue..."